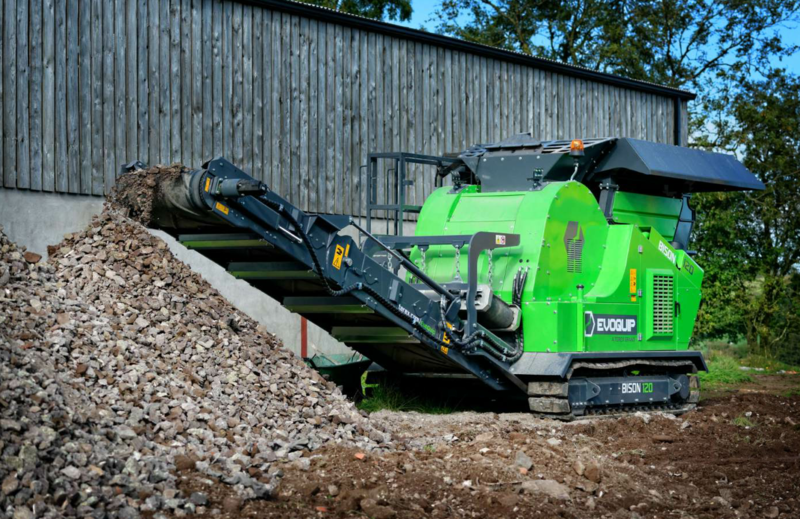 The Bison 120 jaw crusher from EvoQuip is one of the company’s crushers designed to get the job done in confined job spaces. Photo courtesy Terex EvoQuip. The Bison 120 jaw crusher, pictured here on a site in Ireland, exhibited for the first time at a show in Las Vegas in January. The machine has been specifically designed to offer operators versatility, maneuverability and transportability. It’s “small” enough to fit inside a container for transport. It features a 680- by 400-millimeter single toggle jaw crusher that can be adjusted hydraulically using the remote control. But this isn’t the only new crusher on the scene from Terex Corporation. At the AGG1/World of Asphalt 2018 show in Houston, Terex EvoQuip displayed the Cobra 230 impact crusher with output potential up to 275 tons per hour. It’s designed to get into tight sites and crawl while it works. The team at the EvoQuip booth shared that the Cobra 230 can crush reclaimed asphalt pavement (RAP) on the job, and has an integrated pre-screen for fines removal. Check out the specs in this month’s product gallery.